My generation was nothing like as open with our parents as our children are with us, at least not in my part of the North of England, or maybe it was just me. I never told my parents I went in pubs. Not even when old enough. The police told them. 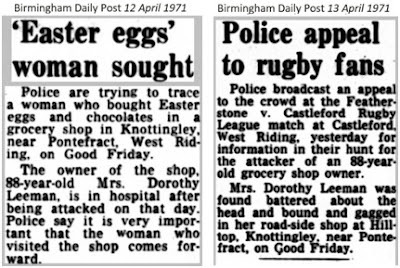 It was Easter Sunday, 11th April, 1971. I can still remember some of what he asked – name, age, address, where I been between 4.30 and 6.30 the previous afternoon, and where I worked. I told him I was a Chartered Accountants’ articled clerk with Goodwill and Ledger in Leeds (actually, I did give their real name), to which he said, “Oh! Do you know Mr. Black?” I said no, there was no Mr. Black where I worked, to which he replied that he worked at the Huddersfield office. It so happened that we did have an office in Huddersfield, and being naïve and trusting, thinking it a genuine question, I said I wasn’t sure but thought I might have seen that name on the letterheads, and that Mr. Black might be a partner at the Huddersfield office. It seemed to arouse the detective’s interest. I had never been grilled by the police before, and found it unsettling, although I tried hard not to show it. The detective moved on to my friends, one of whom was in the middle of a Fine Art degree, with a bolshy “I’m an art student” attitude, full of the deep and mysterious philosophies to which such beings are prone. He was going through a phase of always answering straight questions with enigmatic answers, that’s if he could be bothered to answer at all. He had once been approached on a train in the Midlands by a woman carrying out a travel survey and told her he was on his way to Johannesburg. No matter who was asking, or how serious the situation, he took the same line. It was also the case, coincidentally, that he had the same surname as me, which drew the obvious follow-up from the detective. “Oh! Are you related?” the detective asked. “I suppose we must be,” he answered. The detective was suspicious. Did he think I had given him a false name, that of my art student friend? We had a bit of a laugh about it afterwards. When you consider the gravity of the situation, it was not really funny at all, but we were still at that stage of youthful innocence which takes little seriously. Without actually being part of it (as I said, I was a Chartered Accountants' articled clerk), we liked to imagine we followed the trendy, counterculture of underground bands and magazines such as Oz which was about to face an obscenity trial. You don’t realise now when you see old clips of bands such as Black Sabbath, just how excitingly anti-establishment they seemed, even in name. The police were joked about: you would see “Screw the Pigs” scrawled in four-foot letters on garage doors. This pushing of the limits, I would now say, was only possible because England, on the whole, was a much safer and law-abiding place than it is today, which makes the attack on the old lady all the more shocking. And of course, we did not yet know the awful details of the incident. Being the sort of person who feels guilty even if not (you know, when the teacher asks who peed on the floor and you go red, terrified she thinks it was you, even though it was someone else), it really scared me. I had to explain about the pub in Knottingley and about being questioned, and the two detectives went off satisfied, but it felt very awkward. And that’s how my parents found out I went in pubs, although, they probably knew already. There is now no sign The Green Bottle ever existed. 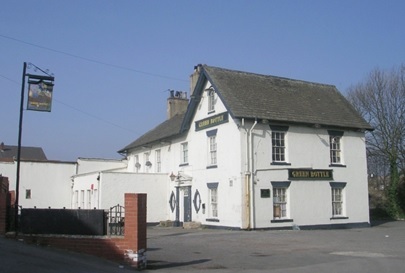 It closed for good and was boarded up by 2009, burnt out in 2010, demolished, and the site redeveloped as business units. *From newspaper archives, I can see that the elderly lady was 88 year-old Mrs. Dorothy Leeman. She had been beaten around the head, bound, gagged and robbed of £80 on Good Friday in her roadside shop at Hilltop, Knottingley, Yorkshire. She never properly recovered and died less than six months later. It was an appalling attack and don’t believe anyone was ever caught. Was it for that wild man of the mountains look, the Chris Bonington, or that you were too lazy to get shaved in the morning? Then came the snow: the unwanted single white ones, thicker and longer, waving out from the middle, to be summarily snipped out with the pointy scissors from the dissecting kit you nicked from school. 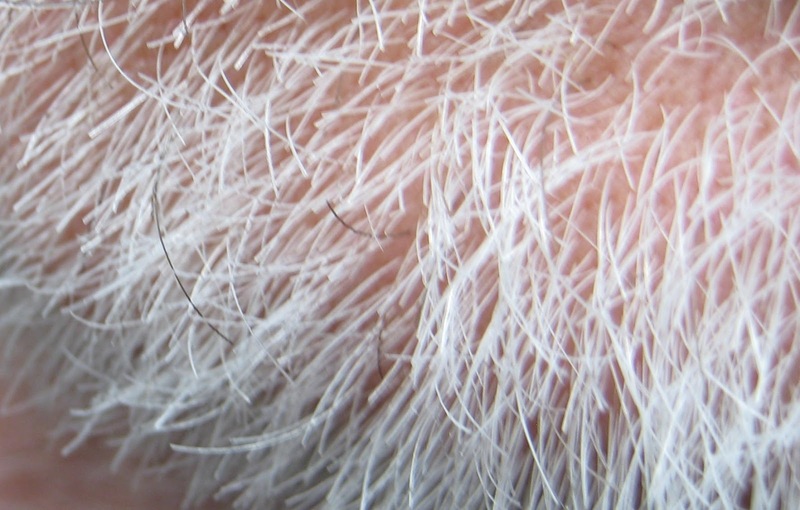 Later, there were more, too many more, giving that distinguished, salt and pepper, silver fox look, or so you liked to think. It was a glorious dappled thing, turning gradually, except for a couple of mucky patches near your ears. Now it’s complete. Except, just now and again, just here and there, a few solitary warm brown strands poke out, fuelling vanity, cruelly taunting you about what it used to look like all over. Does Chris Bonington get them too? By far the most visited and commented-upon post on this blog is one of the earliest: Adsense, Blogger and YouTube from November 2014. It’s one of several off-topic, technical pieces written out of an interest in how the web works behind the scenes, using some of the skills I learned writing user manuals for a software company around nineteen-ninety. The post describes a way of setting up Adsense ads on both Blogger and YouTube together, something Google used to make difficult. It was easy enough easy to have ads either on one or the other, but not both. From the comments, it appears some found the post helpful, although, from a technical point of view, the original post is now redundant. It became so some time ago when Google changed the criteria for YouTube ads. It also never applied to WordPress where you have no choice: with a free WordPress blog, you get ads, like it or lump it. To test things out at the time, I set up ads on this blog where they still appear above (unless your browser blocks them). I set them up as a demonstration, not to make money – I would need to produce far more interesting content and get thousands more hits and clicks to make it financially worthwhile. In the month just ended, it generated the exhilarating sum of 10p, which is typical. Often it’s less, but just occasionally, it will be more if someone shows interest in an ad. In the unlikely event of me still being here if and when it reaches the £60 payout threshold, I’ll donate it to a worthy cause, perhaps by asking long-suffering readers for nominations. Unfortunately for me, some readers detest blogs that carry ads and shun them. Some have actually said so as if I’m unclean. It’s a pity because many of them write rather interesting blogs. Actually, I quite like the attractive blocks of colour that, by means of some impenetrable algorithm, Adsense places at the top of the page. I wonder about them. 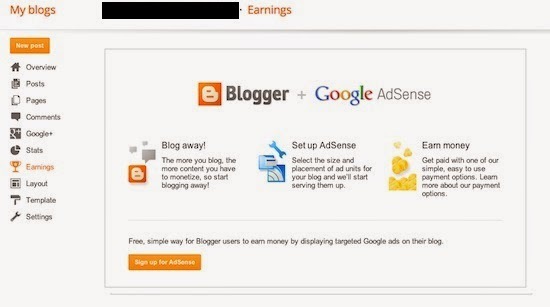 I can see why the original post about Adsense attracts ads from computing businesses, and why posts about stamps and coins pull in ads for philately or numismatics, and why posts about school and college get ads for educational services. I feel miffed that some posts are apparently unworthy of ads. I’m disappointed when a post gets one of those ads that crop up indiscriminately almost anywhere, such as the ones for genealogy or PDF converters. And sometimes, there is the delight of an absurdly misplaced ad – the ones Private Eye call “malgorithms”. I can’t match Private Eye’s quality of malgorithms: e.g. reports of overseas terrorist incidents accompanied by ads for holidays in those countries, or articles about paedophiles attracting ads claiming child models have never been so much in demand, but the other day I did notice that one of my posts about hi-fi stereo was adorned by an ad for hearing aids. Or was I just targeted because of my age? Ads may be putting off some readers, but I am going to keep them, at least for now. It’s my party and I’ll cry if I want to. My father used to say he once knew someone who remembered a man who fought against the French at the Battle of Waterloo. How could this be? I doubted it at first, but, considering it more carefully, it is easily possible. It would have been a memory from around 1940. Those who fought at Waterloo in 1815 would have been born not much later than 1795. If they had survived into their eighties we come to around 1880. And someone born in the eighteen-sixties could have met them and still have been around in 1940. 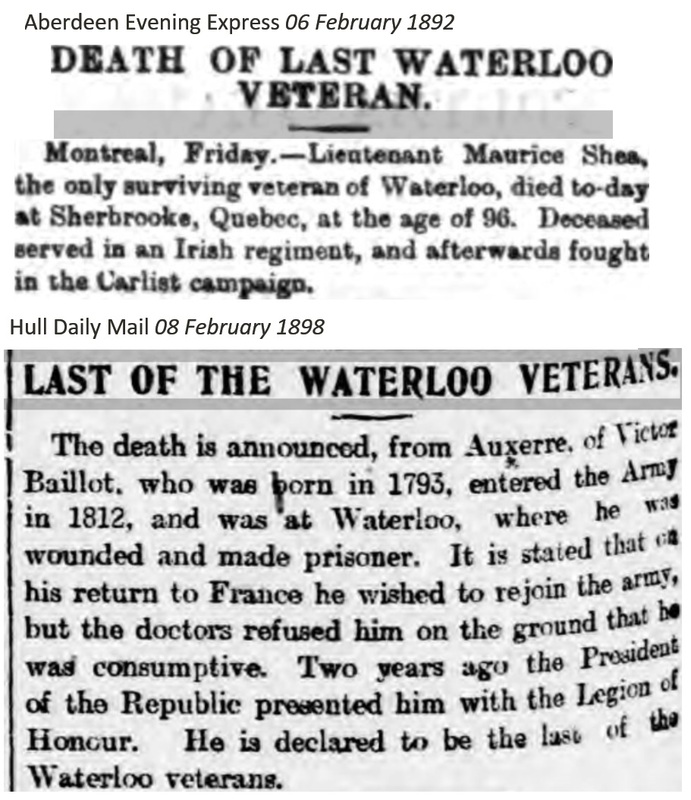 In fact, it is not beyond the bounds of possibility that even my generation, born around 1950, could have known someone who remembered someone who fought at Waterloo. 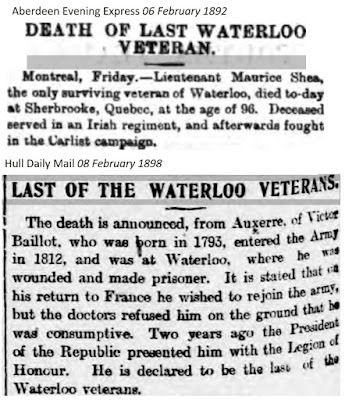 The last British veteran died in Canada in 1892, and one French veteran lived until 1898. I knew people born in the eighteen-seventies who could have met them had their paths crossed. Projecting this forward, I used to know people who fought in the First World War, such as my grandfather who was in the Hull Pals. If I said that to someone young today, they might still remember it in 2100. In fact, those who cared for Harry Patch, the last surviving First World War veteran, who died aged one hundred and eleven in 2009, could still themselves be alive in 2080. So, conceivably, there might be people born around 2070 who in 2160 will be able to say they once knew someone who remembered a man who fought in the First World War. Second and third order living memory is astonishly long; sometimes as much as two hundred and fifty years. 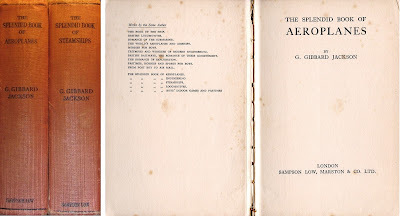 Amongst my dad’s childhood books are two volumes in matching red bindings: The Splendid Book of Aeroplanes and The Splendid Book of Steamships by G. Gibbard Jackson. My dad’s name and address are inscribed inside both of them in my grandfather’s neat hand, together with the dates they were bought: the 25th and 26th of July, 1932. The steamships volume seems to have been bought the very next day on the strength of the aeroplanes one. If so, it was a mistake. 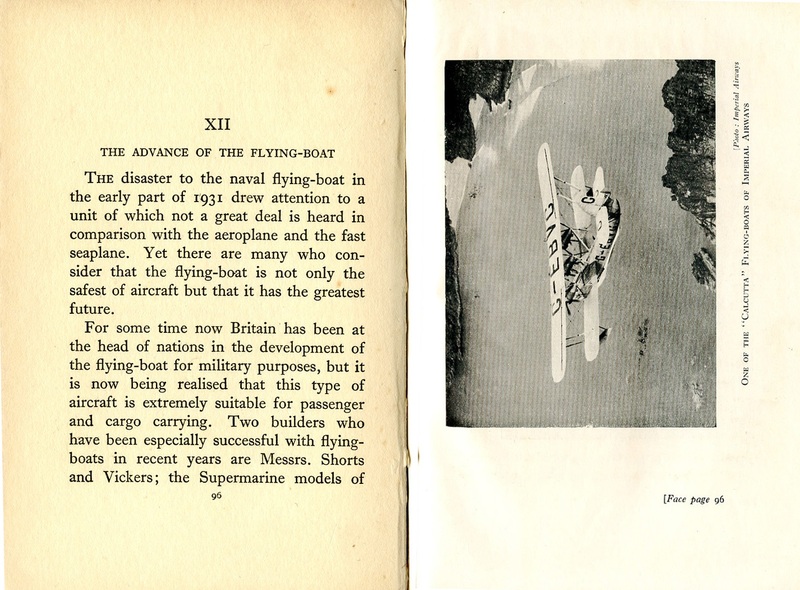 The Splendid Book of Aeroplanes is indeed a splendid book, packed with splendid tales, from the pioneers of flight right up to the nineteen-thirties. In contrast, the steamships book is unremarkable and prosaic, little more than a descriptive record. For example, until I read the aeroplanes book, I had never heard of Mrs. Victor Bruce who made the first flight from London to Tokyo in 1930; a riveting story of forced landings, sheltering with desert tribesmen on the shores of the Persian Gulf, and contracting malaria in the Mekong jungle. This was just one of her many exploits in a life of derring-do. Incredibly, she lived until 1990. Why is she not as famous as Amy Johnson or the Campbells? Then there is the moving story of Saloman Andrée’s balloon expedition to the North Pole in 1897, which failed to make the expected progress. The explorers despatched their last messenger pigeon, then nothing further was known of them until over thirty years later when their remains, diaries and exposed photographic plates were found by chance. They had been forced to land on the ice where they survived for over three months. The discovery of their final camp in 1930 was a global sensation. George Gibbard Jackson turned out books like these on a production line. Fifteen works by the same author are listed in the fronts of the Splendid Books, covering topics such as locomotives, submarines, engineering, exploration, postal services, sports and hobbies. A quick search of the internet doubles the number. Among his last publications were a guide to the Isle of Wight, and From Track to Highway: a story of British Roads. Who was this prolific writer that few today will have heard of? A little research reveals that when he died, George Gibbard Jackson (1878-1935) was postmaster at Fareham, Hampshire. He had joined the postal service in his native Warwickshire, and worked his way up from the position of sorting clerk. Before Fareham he had spent several years as postmaster at Cobham, Surrey. 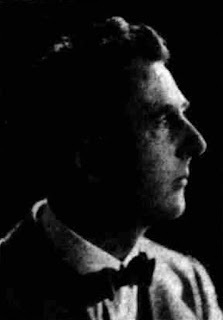 He married twice, first to telegraphist Kate Emery in Coventry in 1901, and then, after Kate died, to Mabel Elizabeth Millington in Stivichall, Coventry, in 1915. He had four sons, one of whom died in childhood. So writing was really a sideline. How could someone with a full-time job, bringing up a family between the wars in small-town southern England, find time to research and write so many books? Did his job have slack periods during the daytime? Did he spend all his spare time writing and researching? Did he neglect his family? What about resources? In a previous post about research before the internet, I was at least referring to research in well-resourced university settings. Gibbard Jackson would have had to rely mainly on local libraries, newspapers, home encyclopaedias and similar works of reference, possibly books borrowed by post from national libraries, and maybe an occasional visit to larger resources in London or Southampton. For example, he might have used Encyclopedia Britannica or Arthur Mee’s Children’s Encyclopedia. 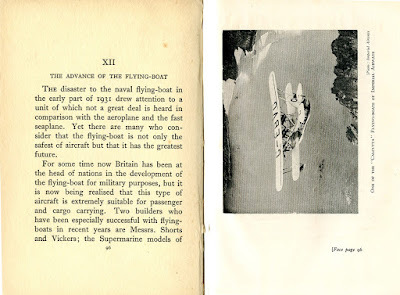 Arthur Mee says quite a bit about the early days of flight – the Wright Brothers and so on – and while it makes only the briefest reference to the mystery of Andrée’s expedition, the newspapers were full of it in 1930 and 1931 after their final camp was discovered. Similarly, newspapers closely followed Mrs Victor Bruce’s flight during September, October and November, 1930. These secondary sources would have been sufficient for a writer of cracking tales, like Jackson, to be able to put together books for boys. And possibly his Isle of Wight book was planned on holiday. Only when you begin to look at the detail that is now available on the internet do you discover the omissions and deficiencies. For example, Jackson includes none of the photographs that emerged from the plates found in Andrée’s final camp. He must have been pleased with his achievements. Perhaps he even made a bit of money from his writing – he was comfortably well-off when he died. But it’s not the kind of writing I would want to do for long. It’s too much like work. 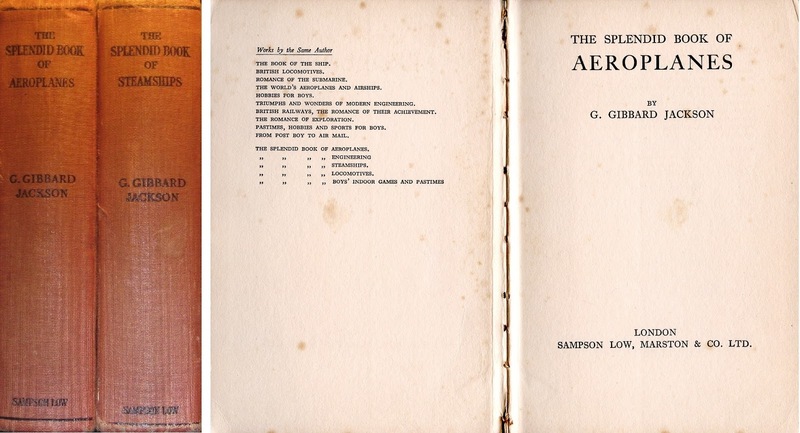 Some of Jackson’s books are now accessible in full-text format, such as The Splendid Books of Engineering, Locomotives and Steamships, but so far there seems to be no online version of the aeroplanes book. Another book from the list of those I should have read in my teens and early twenties, but didn’t because of the television we got when I was around twelve, which cut my reading from two or three books a week down to zero for the next ten years. I’ve never read the 1959 book, or seen either the 1963 film or the 1973 television series. Billy lives in a dismal Yorkshire town, cares nothing for his job as a clerk, has only contempt for his parents and keeps three girls on the go at the same time. He tells outrageous fibs to suit his shifting impulses, acts out jokey sketches with a chum from work and escapes into fantasy where, among other things, he dreams of being a comedy writer. Almost me, except for the three girls on the go: wouldn’t chance have been a fine thing, even just one? This was nineteen-fifties, working-class Britain, not quite on the cusp of the youth consumer boom, before the upsurge of opportunity, when people worked long hours and made do: such as with the old raincoat Billy uses as a dressing gown. There isn’t a television set or record player in sight, and an Italian-cut suit is the only mention of fashion. Remnants of this life were still around in the late nineteen-sixties when I left school for office work instead of university, especially in office work, but things were beginning to change. I had more choice and was able to get away. Billy couldn’t. I felt disappointed at the end when he bottles his chance and goes back to his home and job. Keith Waterhouse was one of Britain’s funniest writers. 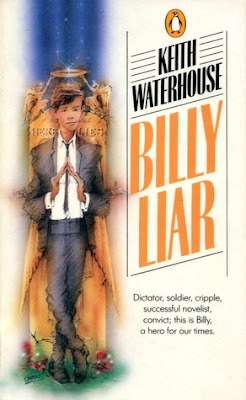 “I don’t mind dark satanic mills,” says Billy, “but by gum when it comes to dark satanic shops, dark satanic housing estates and dark satanic police stations –”, although Billy has no ending to this pre-prepared sentence (p90). He keeps one girl friend’s postcards from her trips to various places around the country because they are at least literate: “I felt mildly peculiar to be treasuring love-letters for their grammar,” he says (p19). Does ta think ah could climb down yon ashpit? Nay, tha’d break thi neck, Councillor! Aye, well ah’sll have to manage it, whether or no. Ah’m bahn down to t’ police station. What’s ta bahn down theer for, then? We’re pulling t’ bugger down. Aye, we are that. All yon cottages anall … It’s all change. All change, nowadays. T’ old buildings is going. T’ old street is going. T’ trams, they’ve gone. I think I know where Monty Python got the idea from. Many accounts of Billy Liar make more of his grand fantasies about the imaginary country of Ambrosia, but I found this merely a contextual element, one of several running through the book, a device now well-used by writers to milk for laughs. Billy Liar is fun to read. It is one of the great nineteen-fifties novels which, along with others by Alan Sillitoe, Kingsley Amis, John Braine, Stan Barstow and others, paved the way for a new style of fiction. Waterhouse’s later novel, Billy Liar on the Moon, set in the nineteen-seventies, might be a good follow up. 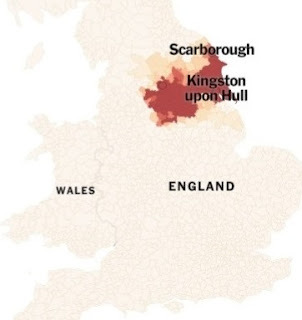 Growing up in a unicultural Yorkshire town (as they nearly all were in the nineteen-fifties), I’m not sure when I first realised there were variations in the way people spoke. I remember a boy climbing around on Filey Brigg with a hammer who said he was “Luckin’ fer fawssls”, and the pen-friends from Bingley, organized by one of the teachers at junior school, who, when we met them, sounded different and used strange words. To my childhood eyes, they even looked different. Goodness, even people from Eastrington and Howden spoke and sometimes looked different to people from across the river in Swinefleet or Rawcliffe: places within a five-mile radius. Later, meeting different people and living around the country, accents fascinated me. I love hearing Buchan Scots and Asian Yorkshire, and used to have great fun winding-up my South London mother-in-law as to whether it was “rasp-berries” or “raazbriz”. She could give as good as she got. So, when I read about the British-Irish Dialect Quiz on the New York Times web site, of all places, it was irresistible. I was bound to try it out and join thousands of other bloggers writing about it. It asks 25 questions about how you pronounce various words, such as “scone” or “last”, and what words you use for certain things, such as for feeling cold or for the playground game in which one child chases the rest and the first person touched becomes the pursuer. It then gives you a map of Great Britain with your area of origin shaded in. If you want, you can continue with a further 71 questions to refine the results further. It got me pretty much spot-on. Words like “breadcake” and “twagging”, and the way I say ‘a’ and ‘u’, give me away most. The explanation of the results is interesting too. It mentions that in Britain and Ireland, unlike North America, local dialect sometimes used to change wildly within ten or twenty miles. Such village-by-village distinctions have now eroded, but the article suggests there is no evidence that regional differences are disappearing, even in the face of technological influences. I find that reassuring.